I have 2 big furry cats that we love so much! I try hard to find good deals on cat food and litter whenever I can. In the SmartSource 7/25/10 it has an ad for a FREE 7 to 8 lb Bag after Mail-In-Rebate! A value of $12.99. To download your rebate, visit www.BuyTheBestTrial.com! I just filled out a form and opened a pdf. We are looking for a low dust formula. so No Thanks, not worth the bother. AS THIS IS THE WAY I THOUGHT THIS WAS SUPPOSED TO WORK. and than charge us for it! I’ve got news for you folks, this is wrong! If you put it out there for free, do it – otherwise don’t put it out there for us! I have more important things to do with my time and money than to waste it being lured here and there! Thank you for your time and attention to this matter. I seriously hope manufacturers realize we Americans are tired and sick and tired of being offered stuff that is supposed to be free and its not! We can’t even get on the website to sound off because we’ve got to sign up for some website, good grief, give me a break, I might not want to sign up for your website! Thanks for stopping by. Some people like filling out rebates since that is “cash back”, however, I agree that it would be nice to have coupons and there are cheaper cat liters out there. We seem to like the Sam’s Brand cat litter because of the price. 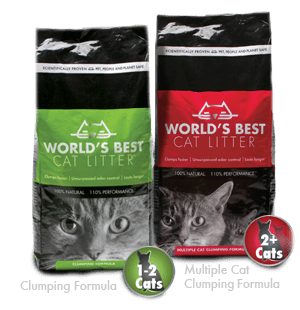 Recently our cats like to use more than one cat box so the dust is becoming an issue and if the “World’s Best Cat Litter” made out of corn – a healthier product and causes less cleaning in the house it might be worth the extra expense. Just my opinion.